Top Ten Ways to Play Your Best in a Tournament. Here's where you can download the video (60 min) or see the trailer (2:12) about the late Marty Reisman (Feb. 1, 1930 - Dec. 7, 2012). "A chronicle of the final three years of Marty Reisman's life. A table tennis champion turned hustler. Pursuing notoriety and motivated by his love of fame and ping pong, he has to face his biggest fear: mortality." Fact or Fiction: The Life and Times of a Ping Pong Hustler is a chronicle of the final three years of Marty Reisman's life, a former international table tennis champion-turned-money player. Pursuing notoriety through his idiosyncratic lifestyle and motivated by his love of fame and Ping Pong, he inadvertently has to face his biggest fear: mortality. Shot over three years, the film follows Marty - a complex mix of childlike excitement, eccentric narcissism and constant charm - as he negotiates between pride, the denial of old age, past defeats and the decline of his fame and fortune, as well as his devoted wife Yoshiko's health, all while clinging onto the hope that his own life and career are just beginning to blossom. The film's observational style, combined with rare archive footage and interviews with key New York and London society characters such Booker Prize winner Howard Jacobson and eminent psychotherapist George Weinberg, work to tell the story of one of America's greatest. I recently watched the video on my computer, along with Tim Boggan. I knew Marty pretty well. In fact, he's how I got into table tennis! Here's the story. The video uses both old and recent footage of Reisman, showcasing him from his early years (growing up in the depression, discovering "a different world" in table tennis, and developing as a player in the hardbat era) to his last days, and especially the last three years of his life. Parts of it are rather dark, with much of the video taking place in a hospital after his heart surgery and shortly before Marty died. There's also footage of him running Reisman's Table Tennis Club, which ran from 1958 to the late 1970s. Marty was perhaps the most flamboyant and stylish table tennis player who ever lived. The video features his many outfits, hats, his tailor and dry cleaner, and even the cane he used - not because he needed it, but for style purposes. Marty quotes poetry, jokes with doctors, talks and sings about mortality, teaches his forehand, shows his microscopes (a hobby of his), demonstrates the cigarette trick, talks about Satoh (the man from Japan who introduced the sponge racket and won the 1952 Worlds, the year Reisman thought he should have won), and talks about how much he was looking forward to a challenge match he had planned with 2009 U.S. Men's Champion Michael Landers. "You'll be in a film with the great Marty Reisman," he explained to Landers. (The film mistakenly credits Landers as being on the U.S. Olympic team.) There's also segments about a planned "Marty's Bar" at Spin TTC in New York. Yes, Marty was an egomaniac, but he didn't hide this fact - in fact, he wore it on his sleeve, with an almost in-your-face ego. And yet he could be incredibly nice if you played along with it and treated him well. He was a God to many, and enjoyed playing the role. Much of his Godhood came about from the stand he took against sponge rubber, insisting on sticking with hard rubber (and later sandpaper), which he considered a far superior game, where two players had a "dialog" when they rallied. Near the end there's about 3.5 minutes with USATT Historian Tim Boggan, who gives sort of a fact check to some of the items in the film. (Hence the "Fact or Fiction" part of the title.) He also shows a "Marty as Don Quixote" picture, symbolizing Marty fighting the windmills of sponge. Here's the video (4 min), which features me, Crystal Wang, and Derek Nie. Here's the ITTF article on the course just completed in Colorado Springs, taught by Richard McAfee. Here's the video (1:19) of Richard McAfee teaching the stroke. Here's the new video (3:56) from PingSkills of the Japanese player (world #27, #16 in January). My students hate it when I throw sidespin or chop blocks at them! Here's the list of videos. Here are two more "Ask the Coach" episodes from PingSkills. Question 1: Usually players follow one style, attack or defense. If I want to change mine to All Around to add some defensive strokes, when is it efficient to start? When the attack style is completely confident or it’s better to study all the strokes at the same time? Olena. Question 2: I realize that in table tennis we use only one part of our hand (upper arm, lower arm, and wrist) so what is the time to use each part of it and can I combined them? Frendy. Question 3: How to reply to a player who simply sends every shot back with push & chop shots? I feel like I am playing the ball against a wall. I start to think that I have to do something to end the rally and then I make the mistake & lose the point. Len Buffey. Question 4: What advice can you give to changing the momentum in a match? I was recently up 2-0 in a match and lost all confidence after losing the 3rd set and continued to go downhill losing in 5. Question 5: Is there difference between a lob and a fish? If yes, what is it? Kaustubh Kulkarni. Here's the article and info for this annual $1250 scholarship - see last paragraph in particular. Deadline is Nov. 1, 2014. "The Shonie Aki Scholarship award, in the amount of $1250 for one year, will be offered to a young table tennis player who has aspirations to complete a college education, become a better player, and a productive individual who would reflect on Shonie's legacy. In order to be considered to receive this scholarship award, candidates must be expecting to attend college in 2015 (and have at least two years remaining to complete their degree) and have GPAs of at least B or better." Here's the latest episode - Hengdian World Studios! - China Day 48 Part 1 (5:49). Here are five pictures of the two playing golf in 2005. The other player is Brian Laudrup, a Danish soccer player. Here's the picture. He just turned 26. Here's the video (60 sec) - I think this is a jeans commercial, but I'm not sure. That's one cheap paddle the "star" is using. Here's the video (5 sec) - looks pretty tasty! I've found it interesting how different coaches and players use timeouts. Far too many use it as a desperation measure, usually late in a match when a player has fallen way behind, and where it's unlikely to make a difference. Almost always it's done when a player is behind. I'd argue that it should be used most often when a player is losing focus at a key time, where the timeout has the best chance of helping to win a game, whether it's in the first game, last game, or any in between. I think most would agree with this. Putting that aside, when should one call a timeout? Let's suppose your player is serving up 9-7 in the fifth. I was once criticized for calling a timeout in that situation, with the argument that it lets the opponent talk to his coach and focus, and so maximize his chances of coming back. But I find that reasoning backwards. With my player is leading 9-7 in the fifth, if both players are focused and play smart, then my player is probably going to win. The most likely way my player loses is if he loses his focus and/or doesn't play smart - so by calling a timeout, I maximize the chances that my player will be focused and play smart, and therefore likely win. In other words, if you are leading, you are in control, and so worry less about the opponent and more about making sure you are prepared. Ironically, I sometimes hesitate to call a time-out near the end of a match when my player is leading because I know there's a good chance the other side will call one, so I get to save our timeout for later if needed. Here's the chart from my book Table Tennis Tactics for Thinkers on when to call timeouts. Number two is the one that's way underused when players are leading in a close game - see the second part of that one. When losing focus before a key point. This is the most important time to call a time-out. A time-out is a good way to get your concentration back. To think about or discuss tactics at a key point. Generally do this when you are about to serve, since you have complete control over choosing your two serves. If you have a coach, he might be able to help choose two serves to use. Call it when you are receiving mostly if you have a good idea what the opponent will serve, and are debating how you should return that serve. Or call it to think or discuss any other tactical plans. It’s also valuable to call a time-out when you are winning a relatively close game (especially late in a match), such as at 10-8 or 9-7, so as to clear your mind, think tactically, and close out that game. This is often when the Chinese team calls time-outs. When falling behind in a key game. It’s useful to call a time-out if you lose the first game and are falling behind in the second (since you absolutely do not want to fall behind 0-2), or if you have already lost two games and will lose the match if you lose another. The key is not to wait until you are way behind; instead, call the time-out when you are still relatively close and can still find a way to come back. The time-out allows you to make sure you are focused and to rethink your tactics. It’s also a good way to give your opponent a chance to cool off if he’s playing well—there’s nothing wrong with calling a time-out in hopes of disturbing his concentration or throwing off his rhythm. Desperation tactic. Far too many players call time-outs as a desperation tactic near the end of a match when they are way behind and are pretty much out of it, but this rarely leads to a win. If you are losing badly, why wait until you are way down in the last game? It’s far better to call the time-out earlier in the hope of not being in this situation, where the time-out will rarely help. We're starting up an afterschool table tennis program this fall with Montgomery County Schools. As noted in my blog last week, one of their requirements is anyone working with students gets a background check - and that means we have to get fingerprinted! So this morning I'm leaving about 8:30 AM to meet at a county office to be fingerprinted, along with fellow coaches Cheng Yinghua, Jack Huang, and John Hsu. I'm hoping to get pictures. If they look into my background they'll find I kill dozens of times every day. More on this tomorrow, though it might be simply a repeat of this note, saying "We've been fingerprinted." Here's a thread at the about.com table tennis forum where Jay Turberville reviews one of the new plastic balls (i.e. not celluloid). Here's an article in yesterday's Wall Street Journal that features Marty Reisman and hardbat & sandpaper table tennis. There were quite a few errors in the article, however - here's a thread at the about.com table tennis forum where Jay Turberville lists nine mistakes, and Scott Gordon adds a few others. Here's an article and pictures of the charity tournament. Here are more pictures. Here's 49 seconds of a very jumpy dog spectator at table tennis. When practicing, most players start off most drills with a simple topspin serve so they can get into the drill, whether it's a looping drill, a footwork drill, or some combination or other drill. But in a match, how often does a rally start that way? Far more often rallies start with someone opening by attacking against a backspin, the most common type of serve. So if you are relatively consistent in these straight topspin drills, you should move to a more advanced version, and start the drill by serving backspin, your partner pushes it back, you attack (normally by looping the deep pushes, flipping the short ones), and then continue with the drill. If you want to get better, you need to both push yourself with more and more difficult drills, and do drills that match what you'll face in a match. Yes, the flamboyant two-time U.S. Men's Champion passes the time ponging in a hotel lobby (1:21). And here's a clip of him winning the 1949 English Open over five-time World Men's Singles Champion Viktor "Mr. Backhand" Barna (1:50). Here's an article in the China Daily (in English) about a match-up of the best shakehand players in the world against the best penholders. But what's really interesting is that they got shakehand and penhold mixed up throughout the article! For example, in the caption at the start, it says, "Shakehand group members (from left) Wang Hao, Ryu Seung-min and Ma Lin, and penhold group members (from right) Ma Long, Zhang Jike and Timo Boll and China's men's head coach Liu Guoliang (center) pose before the match." But of course (as you can also see from the picture), Wang, Ryu, and Ma Lin are penholders, while Ma Long, Zhang, and Boll are shakehanders. I'm wondering if they are going to correct it or not; the story went up yesterday afternoon and they still haven't fixed it. This week's Tip of the Week is about what to do in practice matches. Remember, a practice match is just that - a practice match. The problem is that many only get the second part - "match" - and forget about that first part - "practice." There's an opening - here's your chance to travel with the U.S. Team to the 2011 Pan Am Games in Guadalajara, Mexico! See USATT news item. 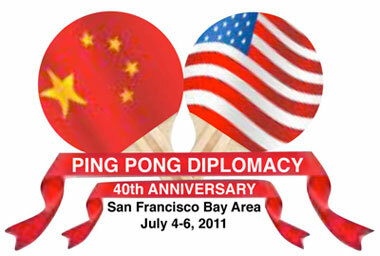 Last week I mentioned in my blog how Marty analyzed President Obama's table tennis game. Now, based on that, he's also analyzed his personality! I assume everyone reading this knows about the charismatic and two-time U.S. Men's Champion Marty Reisman? For those who missed my past mention of it, here it is again! This morning USA Table Tennis Historian Tim Boggan called in a panic. For some reason, whenever he typed an apostrophe or quote mark on a Word document (Chapter 6 of Volume 12 of his History of U.S. Table Tennis, to be exact), Word was inputting two spaces. Now I knew what was causing this, and if this were a Word or computer blog, I'd go over what was happening. The problem was explaining this 30-second fix over the phone to Tim, an admitted computer-phobe. Sure, he can type on a computer, and he can email, but anything beyond that is, well, witchcraft. (I did get his permission to blog on this!) Anyway, it took over an hour. Here's an example of what we went through. Because I wanted to check what version of Word he had, I wanted him to go to "Help" and release on "About Microsoft Word." Unfortunately, for reasons I don't quite understand, he was having trouble finding this. Then he remembered that someone had told him to hit F1 and he'd get Word help. Impressed with his advanced technical knowledge, I told him to do so. He reported that nothing had happened. I tried it on my computer, no problem. It's a standard command. Determined to solve this problem, we went through numerous iterations of this. Finally, Tim asked, "Larry, should I be hitting "F" and "1" at the same time? He'd been typing the letter "f" and the number "1" all this time. Rest assured, we fixed the problem. And although I punched holes in the walls of my house seven times, I'm told that the house's structural integrity is not challenged, and that it will survive many more holes from future computer dialogues with Tim. The first article of a three-part table tennis series on "Creating Spin" I co-wrote with Coach Jack Huang is up at Butterflyonline. Part 1, which went up Friday, is Creating Spin: The Serve. Part 2 (next Fri) is The Loop; Part 3 (following Fri) is Backspin. I did a blog entry a few days ago in the USA Table Tennis USOC web page, on Develop the Basics: Strokes & Footwork. This is actually a reprint of an article I did a few years back as part of the USATT series "How to Be a Champion." Page 26: There's a full-page article by Jef Savage on the ITTF Coaching Seminar I ran at the Maryland Table Tennis Center on April 16-17, 23-24. It's also online. The article includes a group picture, and a picture of me lecturing the class, trusty pointer in hand. Page 31: Here's my article, "Changing Bad Technique." It includes two pictures of me, including one feeding multiball. Page 38: Here I give the stats on the "Youngest To Reach 2500." Page 55: Full-page ad for MDTTC summer camps, which includes pictures and short bios of the coaches - me, Cheng Yinghua, and Jack Huang. At the Easterns, while blocking to warm up Tong Tong Gong's loop, something clicked. It's one of those things I've always known and coached, but it helps when it works in your own game. I'd been holding my racket too high on blocks (both forehand and backhand), and that's why it hadn't been particularly comfortable in recent times. By starting with the racket lower to the table, I can actually raise the racket slightly as the ball bounces on the table, allowing the center of the racket to "follow" the ball. This leads to a quicker block, better timing, contact in the center of the racket, a bit of topspin on the block, and overall, a more consistent block. If you hold the racket slightly higher, you have to wait for the ball to come up to it, and then try to catch it in the center, which is trickier. Holding it higher does give a flatter block, which is effective against some, but the price is less control. But you can do this while holding the racket low by taking the ball right off the bounce and stroking straight forward. This is how many penholders block, and is why they so often give such flat blocks. On Monday I updated the Celebrities Playing Table Tennis page, which now has 1192 pictures of exactly 700 celebrities playing table tennis. Also, the site now has its own domain - yes, CelebritiesPlayingTableTennis.com. Make sure to bookmark it! There are now so many famous celebrities pictured that any short listing would shortchange the site, and any more comprehensive listing would take up more space than there are ping-pong balls in the universe, give or take a few. It's divided into ten sections: Politicians/Leaders, Athletes, Talk Show Hosts, Writers, Actors, Actresses, Musicians, Cartoon Characters, and Other. Here's a fun one that just went up, of actor Jack Oakie, circa 1933, playing table tennis in a suit of shining armor. He acted in lots of movies around that time, so I have no idea what movie this takes place in. Anyone know? Here's his acting record. You can now look up your rating stats, head-to-head record, and other stats at the Table Tennis Spin site! Dang, he beat me to it! (I actually meant to post this last Friday, but had so much other stuff I left it off. Then it got left out on Monday somehow, and then my computer crashed yesterday and so it got left off again. But for those who missed it....) Here's Marty's analysis, which includes a link to the video. (I blogged about this on Thursday, May 26.) Here's an opening quote from Marty: "Not being certain that either president Obama or I may be able to take the necessary time away from our other respective responsibilities for a lesson in the flesh, as an alternative, here is my Presidential Ping Pong 11 Point Internet Lesson that should ensure our national image will never be tarnished in the event our president should ever be challenged to play a competitive match against a leader of any nation having opposing political views."